Kunimoto H, Fukuchi Y, Sakurai M, Sadahira K, Ikeda Y, Okamoto S, Nakajima H: Tet2 disruption leads to enhanced self-renewal and altered differentiation of fetal liver hematopoietic stem cells. Scientific Reports, 2:273, 2012. 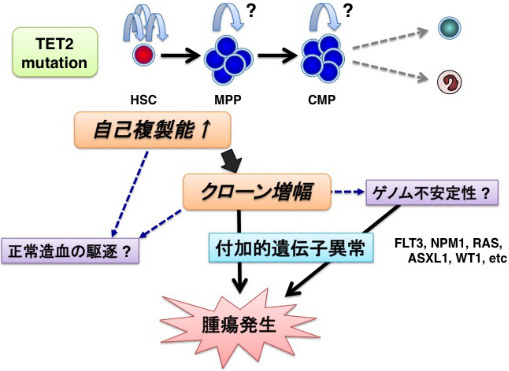 Kunimoto H, Fukuchi Y, Sakurai M, Takubo K, Okamoto S, Nakajima H: Tet2-mutated myeloid progenitors possess aberrant in vitro self-renewal capacity. Blood, 123:2897-9, 2014. Nakajima H, Kunimoto H: TET2 as an epigenetic master regulator for normal and malignant hematopoiesis (review). Cancer Science, 105:1093-9, 2014. Yoshimi A, Toya T, Kawazu M, Ueno T, Tsukamoto A, Iizuka H, Nakagawa M, Nannya Y, Arai S, Harada H, Usuki K, Hayashi Y, Ito E, Kirito K, Nakajima H, Ichikawa M, Mano H, Kurokawa M; Recurrent CDC25C mutations drive malignant transformation in FPD/AML. Nature Communications, Aug 27;5:4770, 2014. Sakurai M, Kasahara H, Yoshida K, Yoshimi A, Kunimoto H, Watanabe N, Shiraishi Y, Chiba K, Tanaka H, Harada Y, Harada H, Kawakita T, Kurokawa M, Miyano S, Takahashi S, Ogawa S, Okamoto S, Nakajima H; Genetic basis of myeloid transformation in familial platelet disorder/ acute myeloid leukemia patients with haploinsufficient RUNX1 allele. Blood Cancer Journal, 2016 Feb 5;6:e392. Chin DW, Sakurai M, Nah GS, Du L, Jacob B, Yokomizo T, Matsumura T, Suda T, Huang G, Fu XY, Ito Y, Nakajima H, Osato M; RUNX1 haploinsufficiency results in granulocyte colony-stimulating factor hypersensitivity. Blood Cancer J. 2016 Jan 8;6:e379. 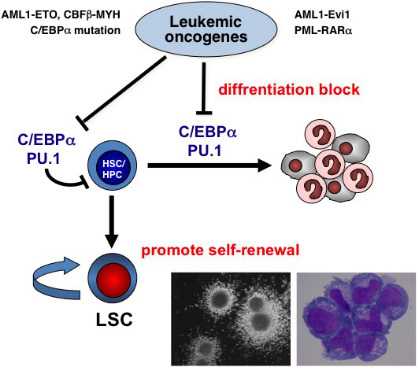 Truong BT, Lee YJ, Lodie TA, Park DJ, Perrotti D, Watanabe N, Koeffler HP, Nakajima H, Tenen DG, Kogan SC: CCAAT/Enhancer binding proteins repress the leukemic phenotype of acute myeloid leukemia. Blood. 101:1141-8, 2003. Ono R, Nakajima H, Ozaki K, Kumagai H, Kawashima T, Taki T, Kitamura T, Hayashi Y, Nosaka T.: Dimerization of MLL fusion proteins and FLT3 activation synergize to induce multiple-lineage leukemogenesis. J Clin Invest. 115:919-929, 2005. 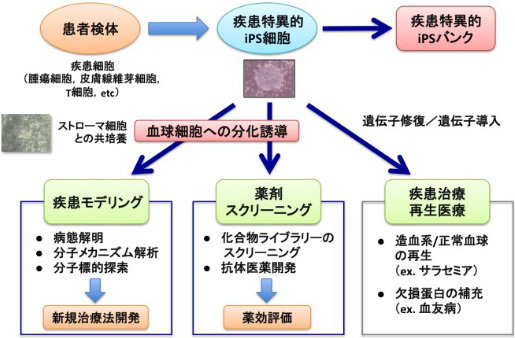 Watanabe-Okochi N, Kitaura J, Ono R, Harada H, Harada Y, Komeno Y, Nakajima H, Nosaka T, Inaba T, Kitamura T: AML1 mutations induced MDS and MDS/overt leukemia in mouse BMT model. Blood, 11:4297-308, 2008. Matsushita H, Nakajima H, Nakamura Y, Tsukamoto H, Tanaka Y, Yabe M, Asai S, Ono R, Nosaka T, Sugita K, Morimoto A, Hayashi Y, Hotta T, Ando K, Miyachi H: C/EBPα and C/EBPα induce the monocytic differentiation of myelomonocytic cells with the MLL-chimeric fusion gene. Oncogene, 27:6749-60, 2008. Nakajima H, Tamura T, Ito M, Shibata F, Kuroda K, Fukuchi Y, Watanabe N, Kitamura T, Ikeda Y, Handa M: SHD1 is a novel cytokine-inducible, negative feedback regulator of STAT5-dependent transcription. Blood, 113:1027-36, 2009.